Mother Nature erased Oregon’s momentum, but a series win is a series win. Oregon managed a doubleheader sweep over Washington State Friday, but both teams were forced to have a day off on Saturday due too a torrential downpour. After the storm blew through, Washington State’s Scotty Sunitsch threw a no-hitter at the Ducks in a 7-0 win for the Cougars. Despite having a no-no thrown at them, the Ducks moved to 5-6 in league action and 18-11 overall with Portland coming to PK Park on Monday. WSU dropped to 3-8 in conference play and just 8-17 overall in what is turning into a very long spring in the Palouse. Sunitsch struck out nine hitters and walked just two. He allowed just one Duck to reach second base the entire day. Despite the no-hitter, the game was still within reach in the seventh inning as Oregon was down just 3-0. But the Cougars scored four more in the seventh to make it 7-0 and the only mystery to the game was whether Sunitsch was going to get the no-hitter. The Cougar pitcher worked his way through the ninth on a fly ball followed by two strikeouts to begin the celebration in the middle of the diamond. Nothing went Oregon’s way on Sunday, but nearly everything went the Ducks’ way on Friday where closer Ryne Nelson was able to come into each game and save both wins. 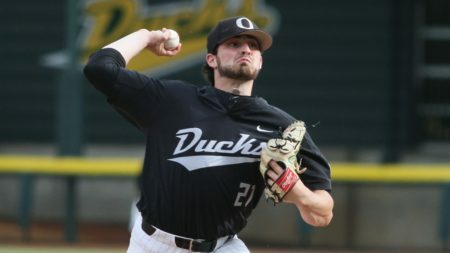 In the nightcap, Kenyon Yovan (3-1) was dominating on the hill as he threw seven innings, allowing just one run, six hits and he whiffed eight as Oregon went on to win the second game 4-2. Daniel Patzlaff provided the big blow in the third inning with a two-run homer. It was 4-1 at that point and that was more than enough offense to support Yovan’s efforts on the mound. Game 1 provided a little more suspense, however. Nelson was in the middle of the diamond with Cougars surrounding him threatening to take the lead. Oregon held a slim 2-1 lead themselves in the top of the eighth inning, but Washington State was able to load the sacks thanks to a couple of walks and a hit batsman. The Ducks couldn’t afford to lose another close Pac-12 game and see their record drop to just 3-7 in league action. But Nelson struck out the next two WSU batters and then pitched an easy 1-2-3 ninth inning to preserve the close home win to take Game 1 of a three-game series with their rivals from the Palouse. All the runs from both teams came in the third inning, but zeros the rest of the way. Matt Mercer (4-2) earned the win as he went six strong innings, giving up just the one run, two hits and five strikeouts. Nelson went 1.2 innings and notched his third save of the season. Oregon cracked the scoreboard after falling behind 1-0 in the third. Kyle Kasser led the frame off with a single up the middle and advanced to third on a fielder’s choice and throwing error. Once Jonny DeLuca stole second, Spencer Steer hit a sac fly to tie the score. Not only did Kasser score, but the fly ball allowed DeLuca to go to third base. He scored easily on Gabe Matthews single to right to give Oregon the 2-1 lead. That was all for either team as Mercer and Washington State’s Isaac Mullins (0-3) and subsequent bullpen dominated. Mullins went 4.1 innings, giving up one earned run and five hits. AJ Block came on and threw 3.1 innings of hitless baseball to give his offense a chance to squeak out a victory. Now the Ducks will try to rebound in Seattle as they will battle the Huskies in a weekend set. Washington is 6-3 in Pac-12 play, but just 14-14 overall. The post Oregon Takes Series Despite Cougs’ No Hit Win In Finale appeared first on DuckNews.com.